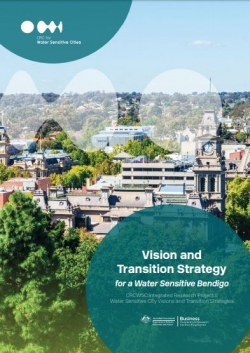 The Cooperative Research Centre for Water Sensitive Cities (CRCWSC) recently launched the Vision and Transition Strategy for a Water Sensitive Bendigo, which defines a vision of a water sensitive future for the city and the broad steps required to enable this transition. This 50-year water sensitive vision is the outcome of nine months of research, analysis and engagement, and aims to orient and align the actions of stakeholders over the long term. Considering the city's long-term water aspirations, benchmarking current water sensitive performance, and exploring strategic priorities for the short-to medium-term has helped situate Bendigo on its water sensitive city transition journey and identified the critical interventions to enable progress.